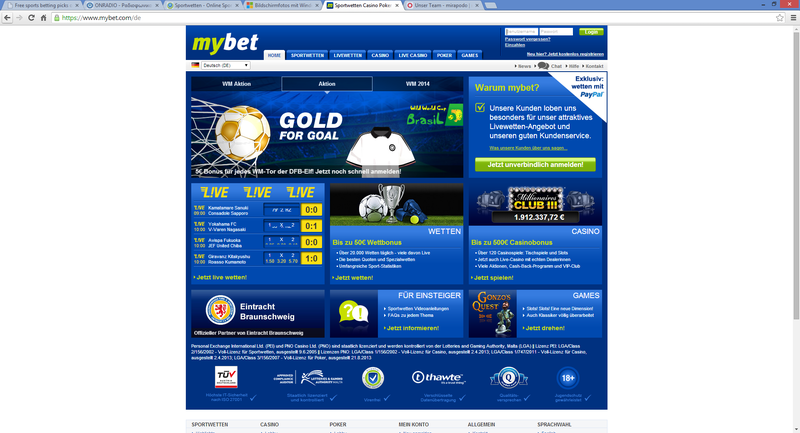 Mybet is one german bookmaker and belong to the biggest for the german market. Mybet is a daughter company from the Jaxx company. In Germany mybet has unless the online site many offline offices where people can place their bets. Unless sports bets, mybet offer casino games, poker games and many other skill games. The deposit bonus on mybet is 100% up to 100 EUR. That means if you deposit 100 EUR in your account, you will have 200 EUR there and use it for betting. To be allowed to withdrawal the deposit amount and the bonus you have to bet them 3 times. That means you have to bet a total amount of 600 Euro. If important events are coming, mybet offers many times deposit bonus of 50% up to 50 Euro. This is another opportunity to increase your winnings. On mybet you will find almost any kind of sports. The main sport is football but you can find many other matches from famous sports like basketball, tennis and ice hockey. On football you will found many kinds of different bets. Unless betting on wins and draws you can find bets on handicap, correct scores, halftime fulltime, goal scorers, red cards, over under goals and much more. Another good thing on mybet are the many live bets. Mybet offer games for live betting all the time. On football live betting you will find many special bets. Also for other sports exist many matches for live betting. Especially in tennis, basketball and ice hockey you will find many opportunities. The security issues have on mybet a very important role. All transactions are encrypted with ssl and can not be listened by others. Also the customer data are managed very carefully. They never are given to third persons and are on safe hands. The odds on mybet are good but don't belong to the best on the betting market. There are some other bookmakers that offer which offer better odds. But this doesn't happen for every match. In general, the marge on mybet is little higher than in other top bookmakers. The customer support on mybet is great. There exists a telephone support till 22 o'clock. You contact them by e-mail also and you will get a response very quick. Mybet offers a live chat also. ou can chat with a support person during all the time. The questions are answered very precise and the most of the time there are not open questions any more. The graphic user interface is very easy to handle in mybet. In the navigation which is in the header you can select between sports betting, casino games and poker. In the left sidebar you can choose the kind of sports you wish to bet. There you will find many sports but main sport is football. After you selected the sports, you can choose the land and the league. Than all matches are shown and you can see the odds. There you can add a match to your betting ticket. After you can enter the betting amount and place your bet. The interface of mybet is very easy to handle. Even new betting players will find very easy how to place bets and handle the application.